Shadow Guy and Gamma Gal get together for a slamming comic-strip story from the dizzy heights of Penguin Island’s frozen peaks! In an amazing graphic format, get the never-before-told story of how our daring duo gained their powers and came together as an unstoppable baddie-busting team. How did Gamma Gal learn to shoot pink plasma? How does Shadow Guy transform into a shadow? And will Gamma Gal really have to take on a stampede of wild puffles? 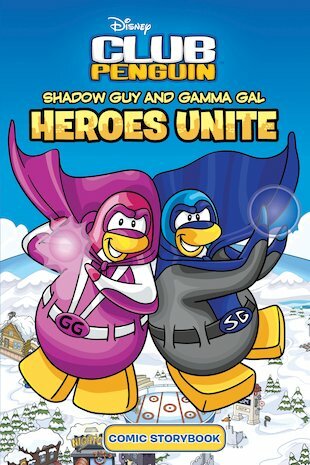 Discover the true identity of our snowy super-heroes in this awesome adventure! It’s So So So So Keep Saying So For 5 Houres Good!!!!! It’s My New Favorute Book (Or Comic). Its wicked i mean it!